The 1909 Croft's Candy E92 baseball card set consists of 50 cards that measure 1½" by 2¾". The E92 cards were included with caramel candies manufactured by Croft's & Allen's Candy Company.. Other E92 cards are known to exist with the same artwork, but released by candy companies such as: Nadja Caramel Company, Croft's Cocoa Company, and Dockman & Sons Company. The Croft's Candy baseball cards have a Croft's logo on the back of each card. Variations of the color of the text on the back are known to exist, with cards being found with black, blue or red ink. Other notable variations can be seen for the cards of Chief Bender (White or Striped Hat) and Honus Wagner (Batting or Throwing). Hall-of-Famers included in this issue are the: E92 Croft's Candy Chief Bender, Frank Chance, Ty Cobb, Eddie Collins, Sam Crawford, Johnny Evers, Hughie Jennings, Nap Lajoie, Christy Mathewson, John McGraw, Joe Tinker, Honus Wagner and Cy Young. 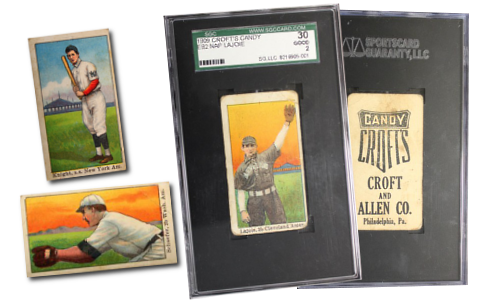 CLICK HERE if you want to sell your 1909 E92 Croft's Candy Baseball Cards.